Esports tend to be pretty flashy affairs, and in forming the Overwatch League, Blizzard weren’t going to be left behind. The stage on which League matches take place comes equipped with a giant ring that changes colour as game objectives are completed. Here’s everything we know about the Overwatch League. The enormous Halo above the stage does seem to have captured some attention. OWL commissioner Nate Nanzer tweeted a photo of it, while esports photographer Robert Paul also captured it in one of his shots. 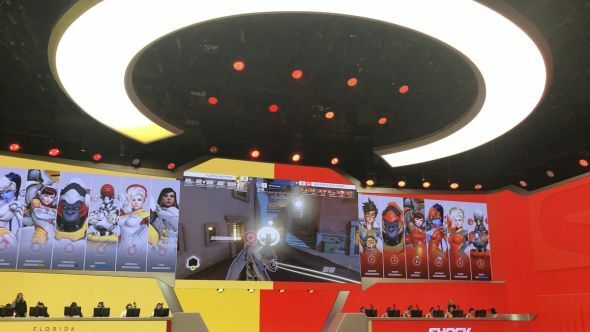 The best look at the ring, however, comes from lead Overwatch producer Josh Lee, who captured a video of the ring filling up as Florida Mayhem captured the point in their match against San Francisco Shock. This isn’t the first time esports tournaments have used dynamic stages. Spectators at this year’s League of Legends finals saw an enormous version of the game’s map light up when major objectives fell, but those tended to be one-off matches, rather than an entire League spanning months. In last night’s preseason matches, San Francisco Shock beat Florida Mayhem 3-1, before drawing in their match against LA Valiant. The eastern hemisphere match was a little more one-sided, as Seoul Dynasty beat Shanghai Dragons 4-0. Tonight’s matches see Los Angeles Gladiators take on London Spitfire, Dallas Fuel play Houston Outlaws, and New York Excelsior against Boston Uprising.